Alaska to California, east to Idaho. Commonly distributed in Western Washington in low to mid-elevations. Moist areas, swamps, lake margins and damp meadows, sea level to subalpine. Coniferous forests. 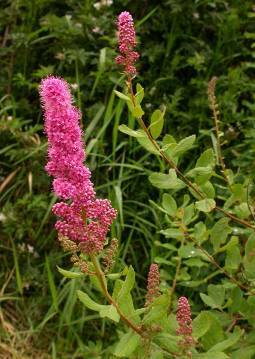 It can be invasive, crowding out other native plants, especially in wetland areas. Occurs mostly in seral communities. Pioneer species in clearcut areas. Juncus ensifolius, Carex vesicaria, C. sitchensis, C. obnupta, Epilobium glandulosum, Angelica genuflexa, Equisetum arvense, Veratrum californicum, Alnus viridis ssp. sinuata, Lonicera involucrata, Cornus sericea, Vaccinium caespitosum, Elymus glaucus, Blechnum spicant, Pteridium aquilinum, Achillea millefolium, Carex eurycarpa, Rosa woodsii, and Ribes lacustre. Seed, hardwood and softwood cuttings, divisions. Bag seedheads to capture ripening seed. Allow pods to dry on plant; break open to collect seeds. Collect seed in the fall. Fresh seed germinates easily without any pretreatment while dry seed may require one to two months of cold stratification. Seeds should be soaked for 24 hours before stratification in mesh bags in peat. Can be stored for at least one year. Can be grown from seed, softwood hardwood cuttings, root cuttings, or division. Responds well to bottom watering. Plants 3+ feet on center, cuttings 2+ feet on center. Fast growing, to 3-6 feet tall and spreads easily, forming monocultures. Short-lived, less than 50 years. Washington State Dept. of Ecology. 1993. Restoring Wetlands in Washington: A Guidebook for Wetland Restoration, Planning and Implementation.